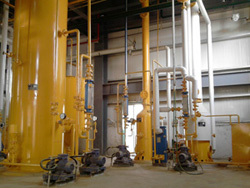 Vegetable oil extraction is a complecated process. The vegetable oil we buy in stores or markets is processed in two ways. It is expelled through force with oil extraction machinery, or extracted by chemicals with solvent, commonly hexane derived from petroleum. This solvent evaporates off, leaving the oil. This is currently the cheapest and quickest way, so it is used for making the cheapest vegetable oils, both for industries and consumers. Making vegetable oil with solvent utilizes the principle of extraction in chemistry. It selects a kind of organic solvent to extract oil content in vegetable seeds after close contact with feeding material. For rotating extractor, the prepared material is feeded into an inlet hopper at the top of the extractor. In the baskets, the material is extacted, rinsed, drained and then unloads. The material moves in a path counter current to the flow of solvent. The oil rich miscella is filtered before being pumped further to the distillation system. Expeller-pressed oil by certain oil extraction machinery is nearly the same as traditional vegetable oil extraction way and it provides the highest quality and most healthy oils. Oils produced in this way have to be protected from oxidation. As you can imagine, these are huge operations. (3) Cold-pressing also slows down production quite a bit. 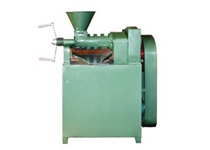 One industrial oil extraction machinery on the market can process 1.4-2 tons using hot press and .7-1.5 tons for cold press, depending on the oilseed used. Note: We acept enquiries in English, Español (Spanish), Русский язык (Russian), Français (French) and العربية (Arabic). Our professional team will reply to you within one business day. 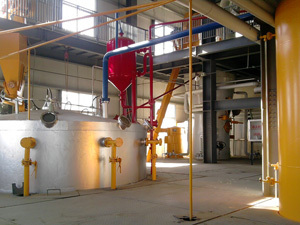 Please feel free to contact usto get more info about vegetable oil extraction!